It's early still, but Cleveland Cavaliers rookie forward has arguably been the worst-performing No.1-overall draft pick of the lottery era. In the first 31 games of his NBA career, Bennett has put up stats of 2.4 ppg on 26.9 percent shooting and 2.2 rebounds in 10.4 minutes per game. His PER of 1.1 rates 10.1 units worse than the rookie mark of legendary bust Kwame Brown, and a 5.4-foul 36-minute average suggests that he'd nearly foul out in every game with a starter's minutes. It's hard to imagine a worse beginning to his pro career, particularly considering that Cavs fans have started booing him somewhat regularly. 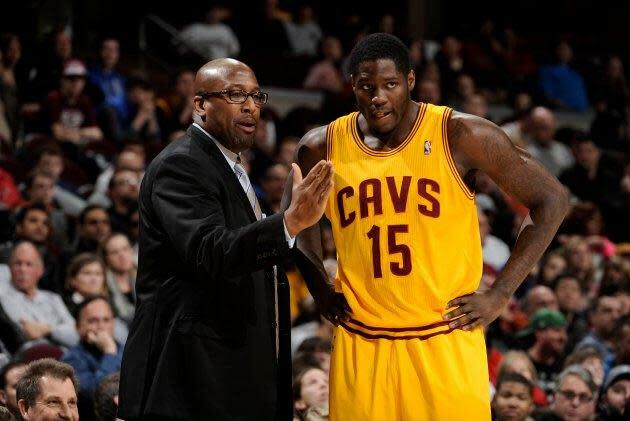 Even before he didn't play a minute in a 120-118 victory over the Lakers on Tuesday night, rookie Anthony Bennett was being asked whether he'd be interested in going down to play with the Cavaliers' owned-and-operated NBA Development League franchise in Canton. To this point, the Cavs have resisted a Canton assignment, believing they can monitor his progress and development more carefully if he remains with the team. "We've been able to find minutes for AB, from time to time, whether it's at the small forward or power forward," coach Mike Brown said on Tuesday. "That hasn't been a bridge we've crossed yet." Bennett was asked what he thought had to happen for him to gain more confidence. It's difficult to know how to bring along young players best, particularly from an outsider's perspective with someone who seems to lack all confidence and a clear sense of how to get his career back on the right track. Nevertheless, it's a little confusing as to why the Cavaliers haven't bitten the bullet and given Bennett a chance to restart his career in Canton. While there is certainly some shame in sending a first-overall pick to a minor league, the fact is that Bennett has already hit something resembling rock bottom as a Cavalier. The stats are one sign, but there's more: admissions of no confidence, confusion, and a disturbing lack of effort that likely has its roots in those other two issues. Monitoring a player closely can be valuable, but Bennett's problems seem deeper than anything that can be diagnosed in practice. The D-League, then, could at least give him the opportunity to remember what made him a highly regarded prospect out of UNLV. Although he was a surprise pick by Cleveland, Bennett at least showed enough to warrant such a selection in a draft without a clear best player. Unfortunately, he's struggled, in part due to some miscasting on the wing, and needs to figure out how to become an NBA-quality player again. The talent is there — Bennett showed ability in the preseason — but he has to find it again. The D-League exists for just this kind of situation, as Minnesota Timberwolves rookie Shabazz Muhammad has already learned this month. It makes sense that the Cavaliers would want to keep their first-round pick — presumably still a part of future plans — as close to the big club as possible. But Bennett's bad start is threatening to become a legendarily ineffective season. If the player is ready for the demotion, then it might be time to consider it as the most prudent decision. Waiting for Bennett to turn things around doesn't seem to be working.